While the successful 2018-2019 Varsity Regular Season and Playoffs is in the "rear view mirror" for the Griffins, a pair of Vianney Seniors left an unquestioned exclamation point this past weekend on the Mid States Senior All Star Game. The Mid States Club Hockey Association selects two Seniors from each high school club and invites them to one of two Senior All Star Games. Vianney participates on the South White Team All Stars and this season the game was held on Sun. Mar. 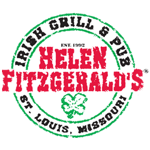 10, 2019 at the Webster Groves Ice Arena. The South White Team Seniors beat the South Blue Team Seniors 4-0. 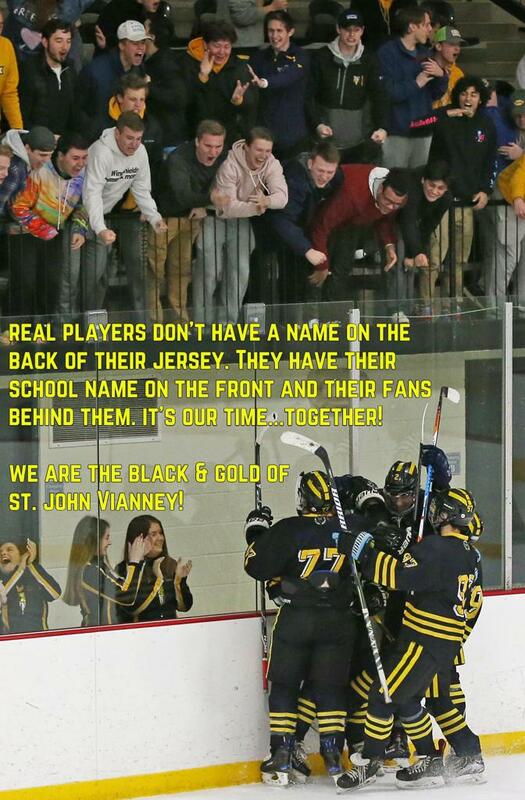 Vianney forwards Andrew Cook (#10) and Danny McGlynn (#9) represented and did so in a grand fashion. After fueling the Griffins all season long and finishing first and second in scoring on the Varsity Team (McGlynn 16 Goals / 10 Assists 26 Points, Cook 8 Goals / 17 Assists 25 Points), the Vianney Duo were responsible for three of the four goals scored in the South All Star Game. McGlynn finished the game with 2 Goals and 1 Assist, while Cook had 1 Goal and 1 Assist. Congratulations to Danny McGlynn and Andrew Cook on an excellent effort in this annual event. 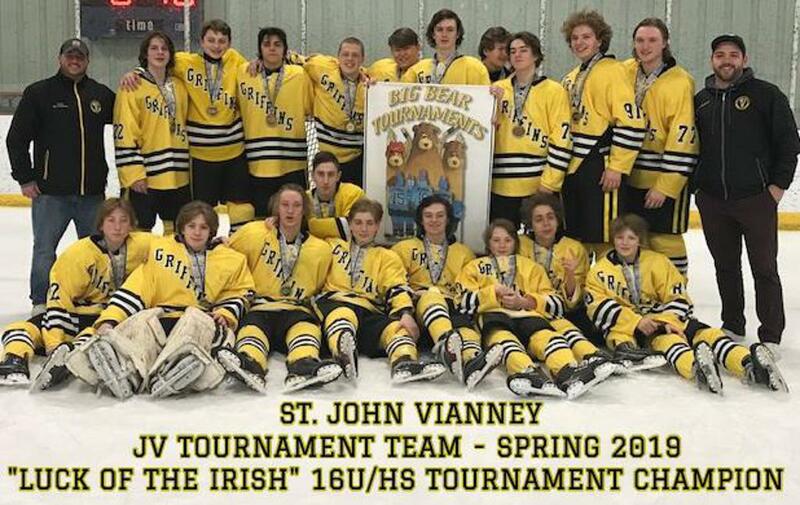 The Vianney Spring 2019 Tournament Team rolled off five straight wins to capture the Championship of the Luck of the Irish 16U/HS Division. The Championship game was played on Sun. Mar. 10, 2019 and Vianney beat the Affton 16U team 3-2. 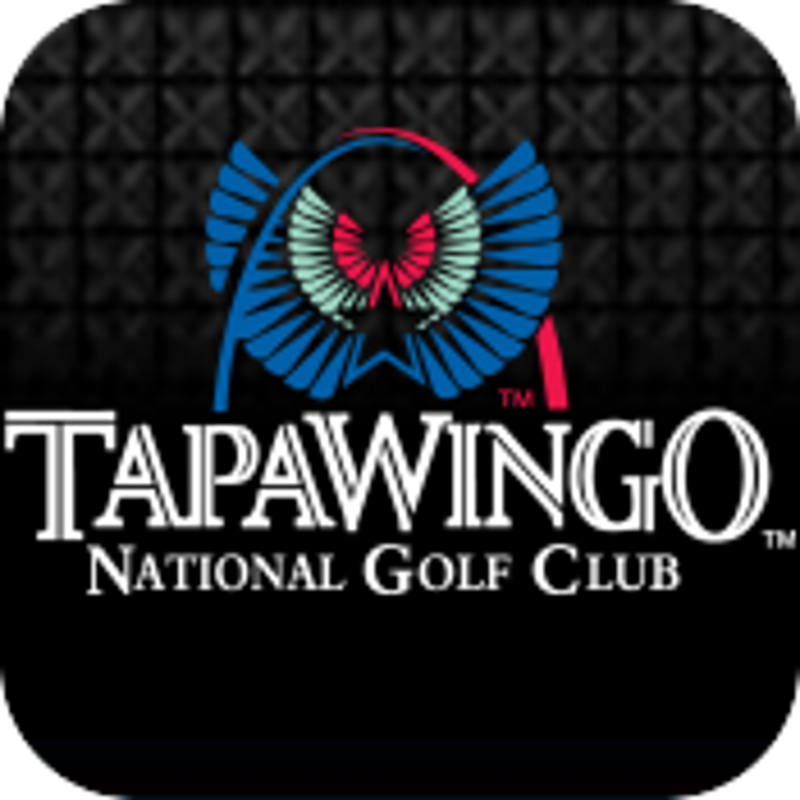 Other wins on the weekend....4-1 Win over Twin Bridges Lightning, 4-1 Win over Kansas City Mavericks, 9-2 Win over Wichita Jr. Thunder and 4-1 Semi Final Win over Granite City Warriors. With a 5-2 victory tonight Sun. 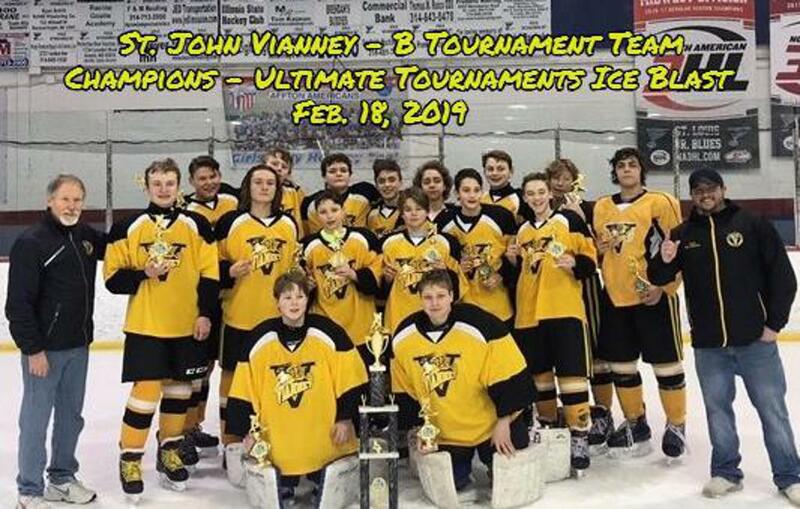 Feb. 17, 2019 over Twin Bridges, the Vianney B Tournament Team won the championship of the Ultimate Tournaments St. Louis Ice Blast. Goals scored by, Waigand (2), Henning (2), Powers (1) and Hazelton (1). Great job boys and Coaches! THANK YOU TO OUR FANS.....YOU ARE OUR 6TH MAN ON THE ICE! 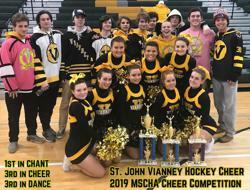 The On Line Vianney Hockey Team Gear and Spiritwear Store is NOW CLOSED for Team Gear and Spiritwear…. ENJOY YOUR 2018-2019 SPIRITWEAR AND TEAM GEAR - GO GRIFFINS! BE A GRIFFIN HOCKEY CHEERLEADER - CHEER WITH A CHAMPION! 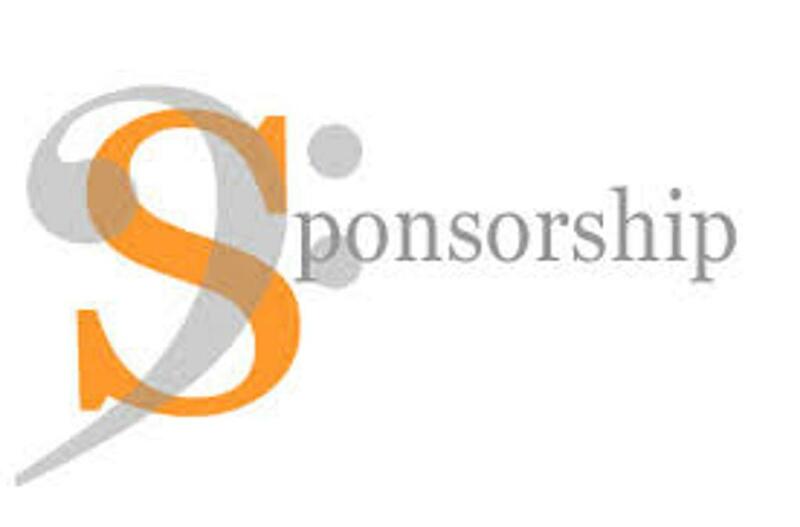 Interested in becoming a Vianney Hockey sponsor or advertise in the Game Night Program or on our Website? 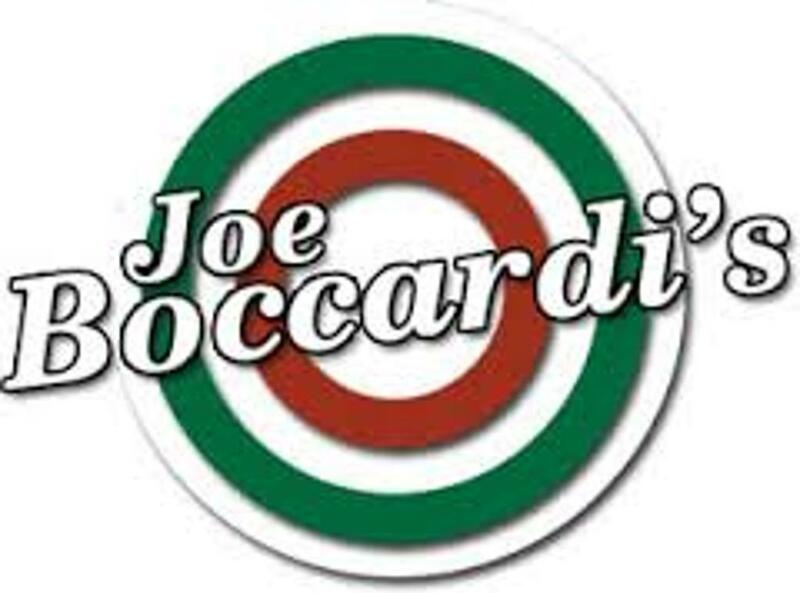 RT @vianneygriffins: @JrBluesHockey @BoccardiJoe Congratulations, Joey.